The sprite thumbnail viewer in action! 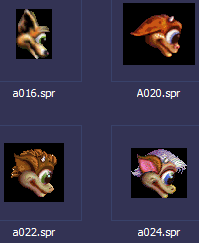 The Sprite Thumbnail Viewer is a tool for Windows made by GreenReaper that allows you to preview sprite files for Creatures series games in Windows Explorer, just like other image files. Considering how most sprite files have four-letter names, this is very useful for figuring out what image file you want to edit! The viewer works on SPR files (C1), S16 files (mostly C2) and C16 files (C3 and DS). Sprites are shown as thumbnails in Thumbnail view mode (except on Windows 98), and on the left in the Details section in other views. There is nothing to configure, just install it and start viewing thumbnails! This page was last modified on 24 June 2017, at 19:52.